Photography & Polaroid Transfer Art. Colorado History. Digital Pinhole Gallery. Flowers and still life. Pink Rose. Two beauties - portrait portfolio. Night Storm. Weather portfolio - black and white picture of a distant storm. Portfolios of image and emulsion transfers. Architecture Abstracts from Albany, NY. 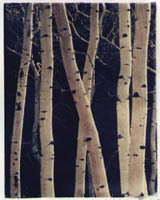 Aspen Grove from Colorado. Adobe architecture from New Mexico. Family Album. Technical information and stories behind these pictures. Catalog of transfers created during 1996-98. Garlic in my photography. Selection of books for garlic growing, cooking and healing.